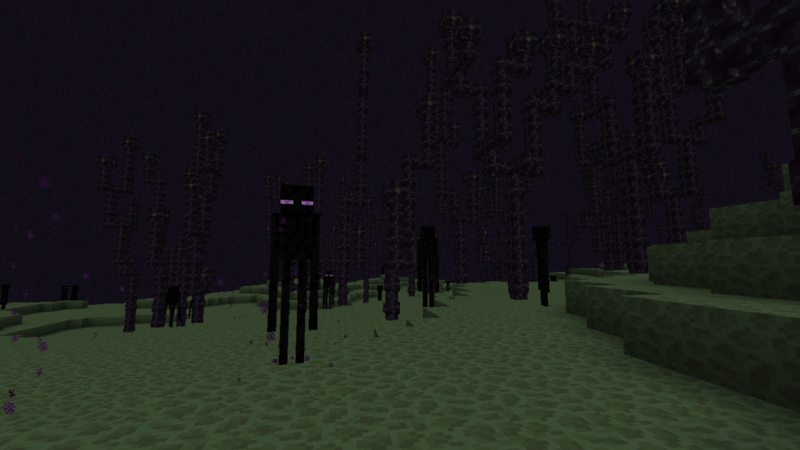 I got bored working on my new, needlessly complicated fishing sorting system and decided to take a trip to The End. 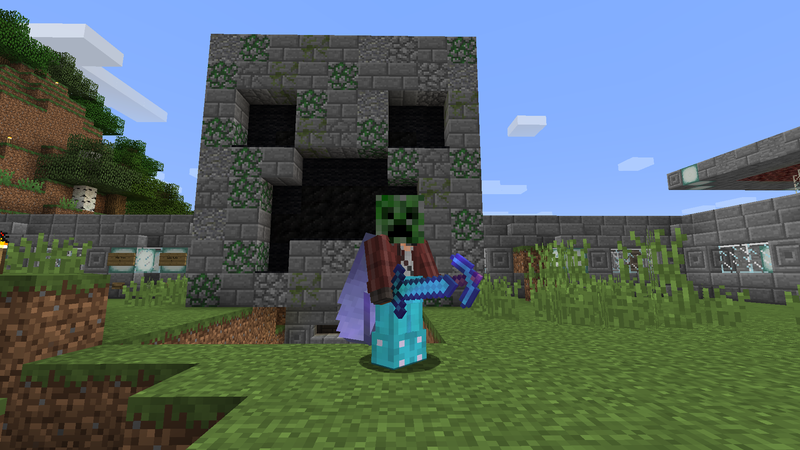 I figured it wouldn’t be too bad so I didn’t really prepare any potions, had the wrong helmet and shoes, and was carrying my good pickaxes. The 1.9 update didn’t automatically re-spawn the dragon so I made some end crystals to do it. 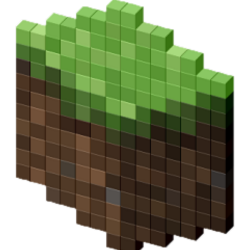 They require ghast tears so we finally have a big use for the tears. 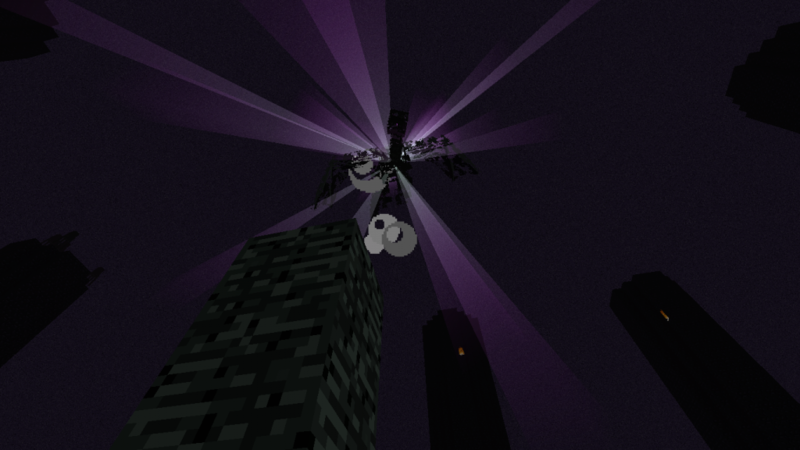 When I spawned the dragon it also re-spawned the obsidian towers that the healing crystals sit on top of so that can be a pretty good renewable source of mineable obsidian. I tried to just kill the dragon without thinking much about it and it was a bad idea. I couldn’t hurt it enough without the healing crystals refilling it so I shot all the easy to get ones. Still no luck, even with just two left that are protected by a cage I couldn’t out damage the heal. It’s also impossible to leave the end without dying once you spawn the dragon because the exit goes away. The dragon was wrecking everything we had set up in the prep room too. 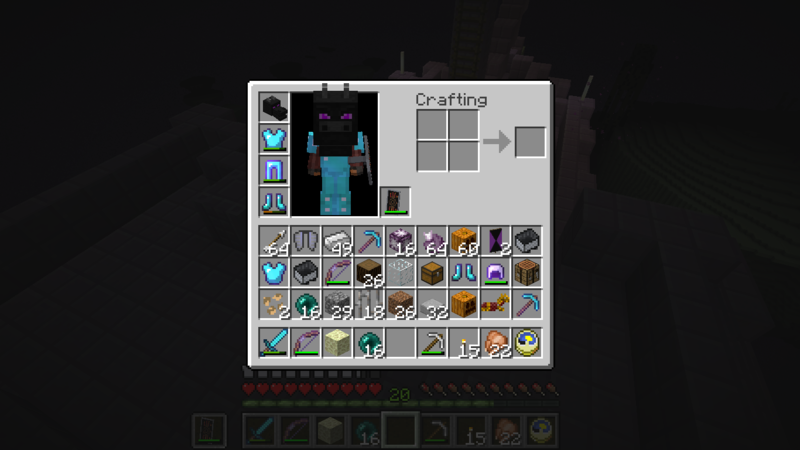 I barely managed to dump all my non essential valuable into an ender chest before he destroyed that too. 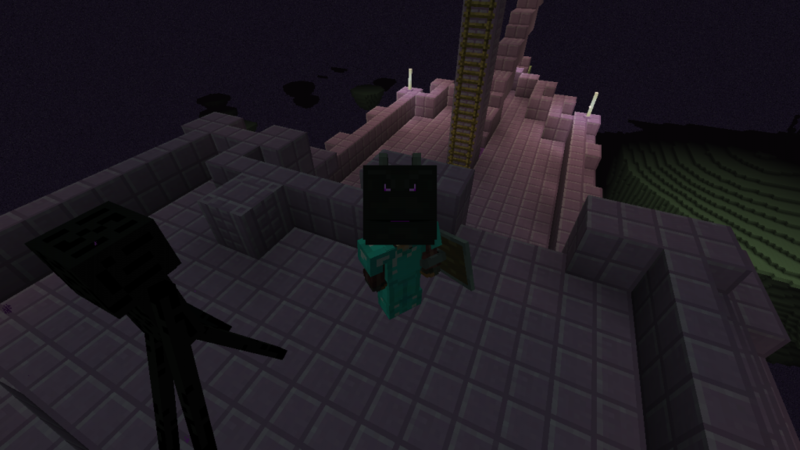 Then he launched me like 200 blocks into the air and killed me. Got him! Unfortunately I was standing in the portal so I got warped all the way back to my bed way far away. I made my second long trip back and went looking for the new portal. It was floating right next to the void so I pillared right up to it before throwing in an end pearl. Welcome to the end islands. 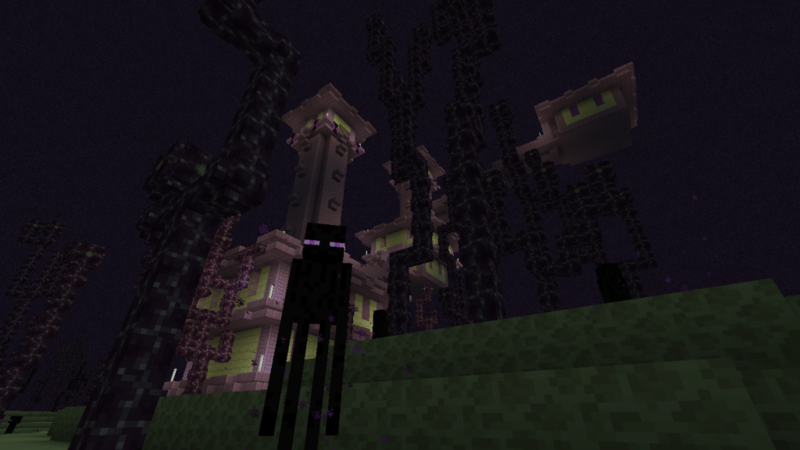 Nothing but endermen and chorus trees for hundreds of blocks. I collected some of the plants but what I really wanted was to find the cities. After a long time wandering I found one! After fighting through a ton of super annoying shulkers I made my way all the way up the towers. Of course I lucked out and got 0 chests in the entire city so it was time to find another. Success! I found a city with a boat. It was a little scary getting there as I had to bridge a gap over the void just to get to the city. This was made harder because I had a pumpkin on my head the whole time obscuring my vision. You can switch to F1 mode which makes the pumpkin overlay disappear but it also makes it so you can’t see your inventory or health/hunger bars. 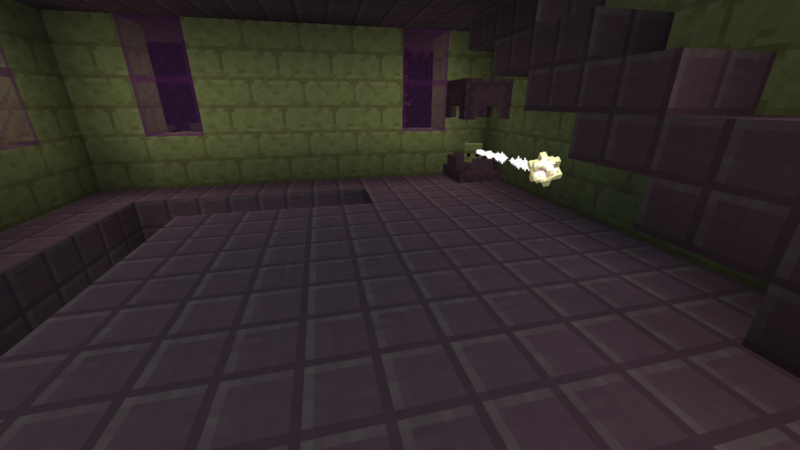 Inside the main tower was a crazy room with no real platforms and like 10 shulkers. You get hit repeatedly causing you to float in the air all the way up the tower. I tried to get a screenshot but it was too much bombardment. There were some chest up top but nothing too special. Now I had to bridge over to the boat which was also over the void. 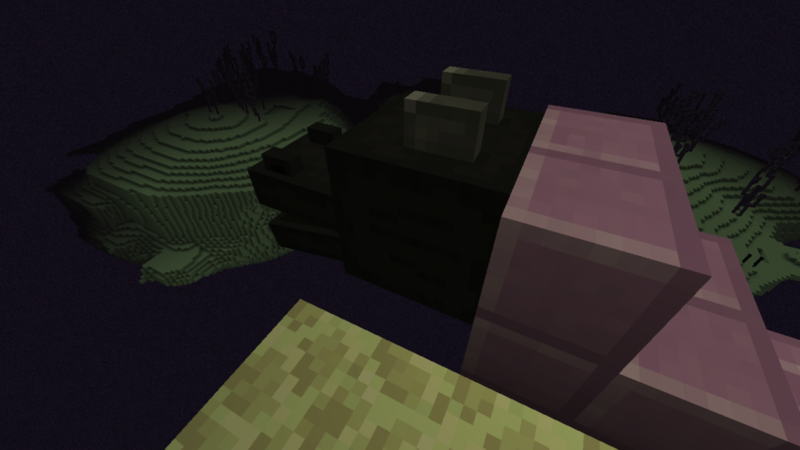 What made it worse was two shulkers on the back of the boat trying to knock you off your bridge or cause you to float too high and fall to death. Of course I still didn’t have my feather falling boots but managed to make it. Finally! I got my wings. Then on my way out I noticed the front of the boat looked odd. I didn’t know this but it had a dragon head! Of course it was also floating over the void but I made a platform and grabbed it. Not a bad loot haul for 4 or so hours of fighting and exploring. 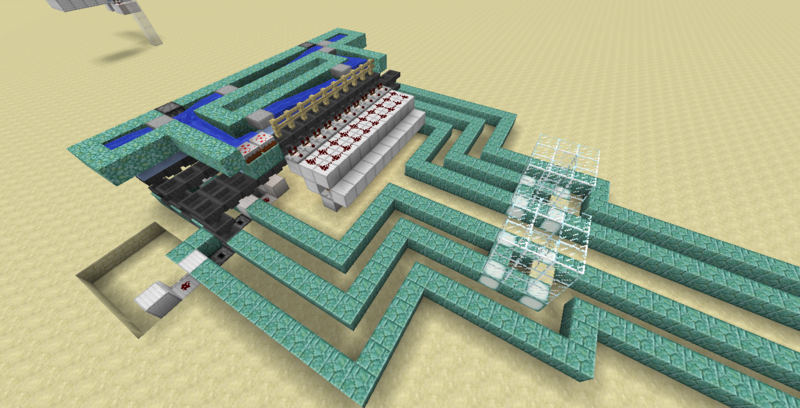 I think I have nailed down the new and more efficient item sorter for the guardian farm. It’s even expandable this time just in case. 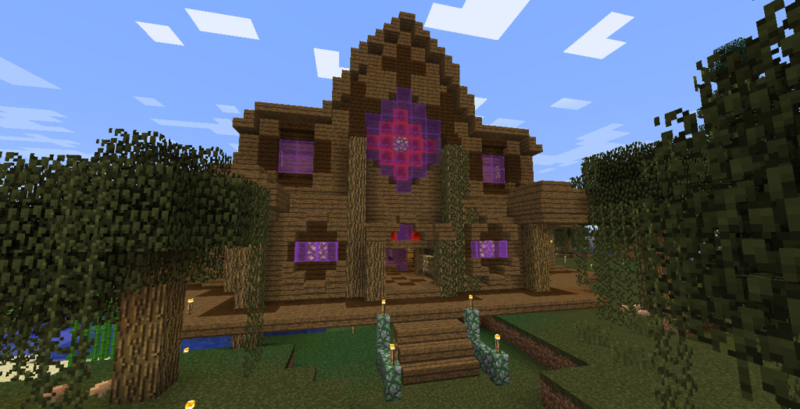 We have officially moved over to 1.9. 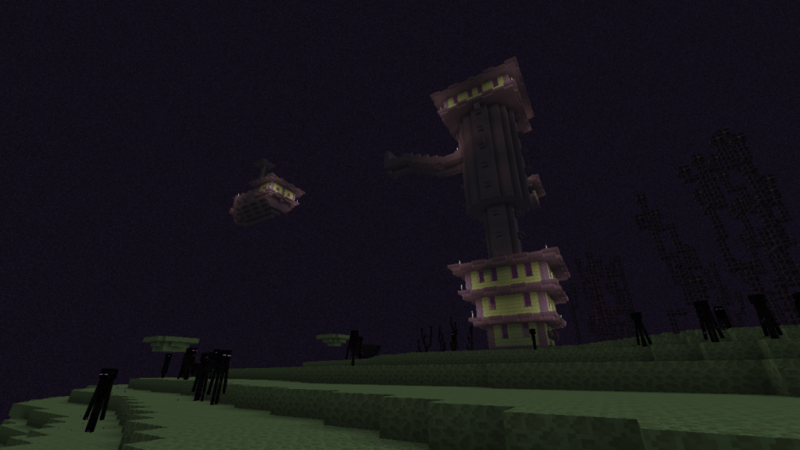 I’ve gotten the witch farm and portal gold farm fixed but the guardian farm is going to take a lot of work. 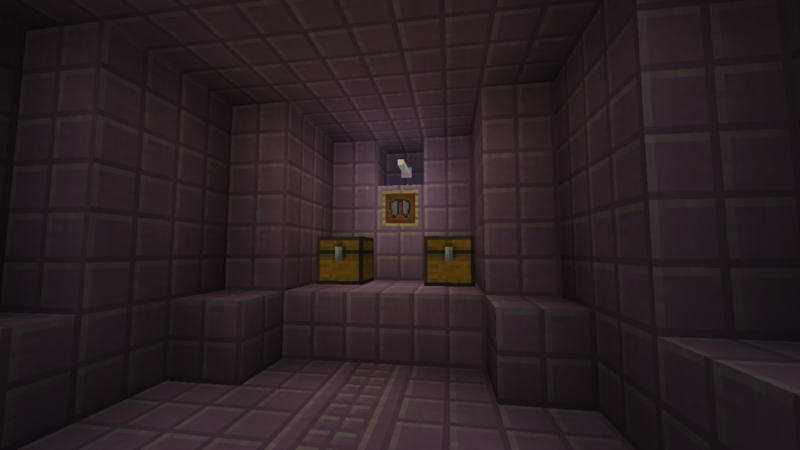 Probably will take this time to completely redo the item sorting area as well. The item elevator we need to use doesn’t fit in its current configuration anyway. 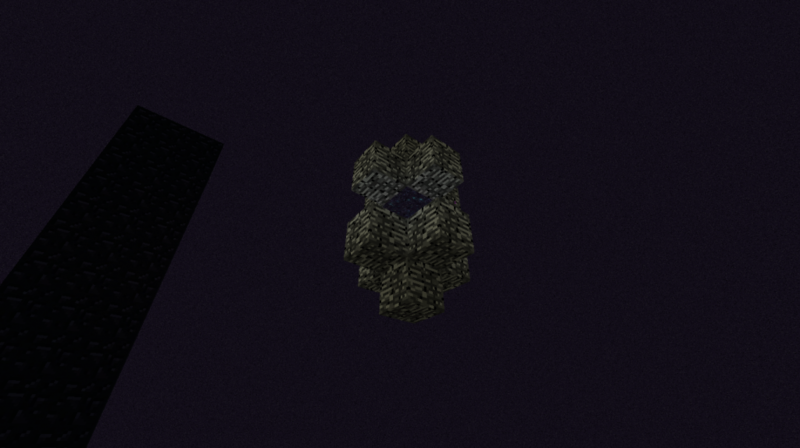 So far I’ve only seen one bug with pistons causing possible phantom block duplication. It’s already been logged and fixed so I’m hoping it doesn’t break anything else before the first patch comes out. 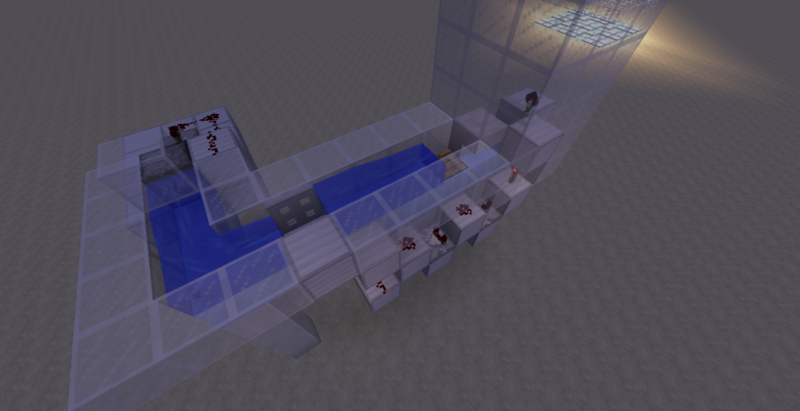 With the changes in 1.9 the shifting floor design no longer works. Time to upgrade it to a water pushing design. Here are some pictures before the tear down. The storage building doesn’t need any changes at least. This one seems to be the main item elevator people are using now. 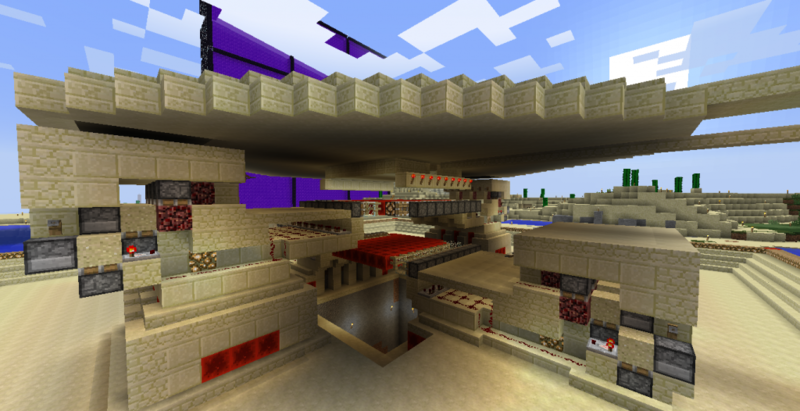 It uses some redstone but no clocks. It handles large amounts of items coming in super fast and doesn’t have the issue of items being rocketed into the air that some new designs have. 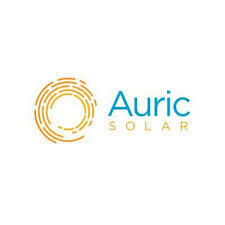 Need to do some more testing but this looks to be the design we’re going to have to use.